Our acquisition of Comm8 encompassed their asset management tool – TurboTrack. TurboTrack can provide vehicle management, WHS monitoring, alarms, incident management as well as improve productivity and time management and provide reporting and status updates. TurboTrack has developed a unique interface that features sophisticated tracking information globally accessible online. It combines the technologies of Motorola portable and mobile radios, satellite devices and cellular GSM and UMTS tracking devices on a single easy-to-use interface. Unique to TurboTrack is their ongoing software development, their in-house programmers are constantly upgrading the system to offer additional benefits through extensive customisation. A variety of reports can be run in the TurboTrack interface which can be exported in various formats for editing or forwarding such as PDF, Excel or Rich Text Format. 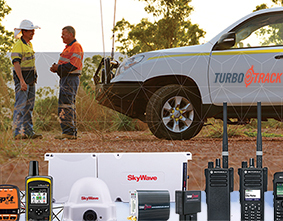 Some key features of TurboTrack include real time tracking so you can view your vehicles, staff or radios from anywhere in the world with an internet connection to monitor speed, direction and location of your assets at any one time. Replays allow you to select an asset, date and time to replay; emergency response includes emergency calls and man down alarms; and geo-fence provides entry and exit alerts among other custom designed features. For more information on TurboTrack head to their website.